Modern environmentalists and transportation planners have often dreamt of places which require no automobiles to move yourself from point A to B. In the City of Houten, this dream has come true. 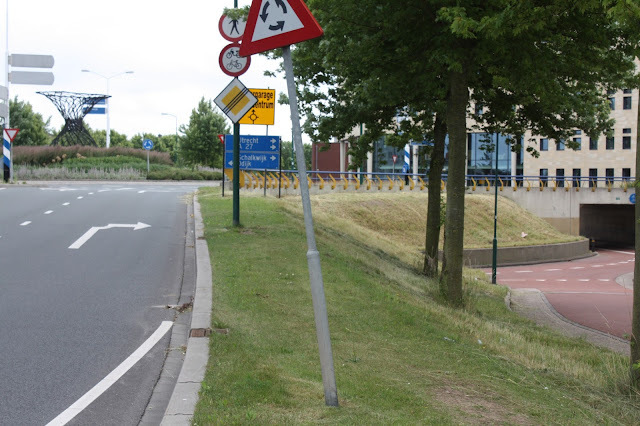 Houten is located south of Utrect in The Netherlands and has approximately 50,000 people where driving within the City takes longer than bicycling. 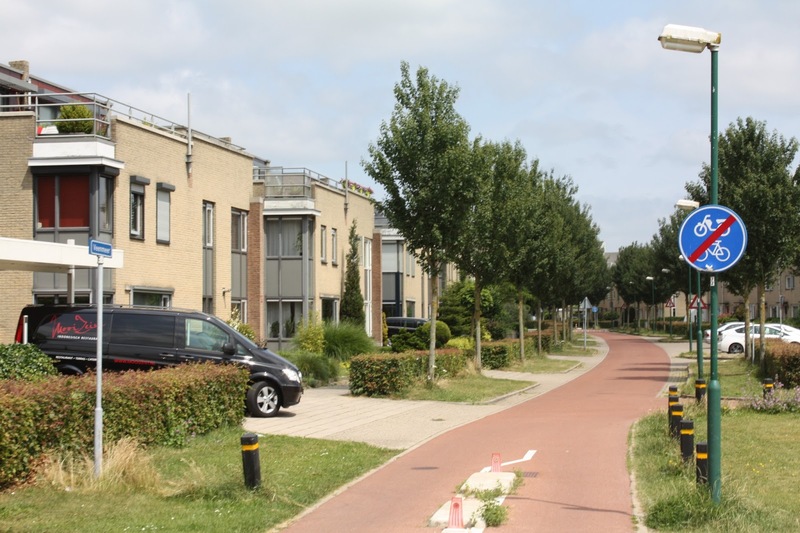 Travel with me through Houten to not only explore the fantastic facilities, but also discuss the social implications of these facilities on the a child's quality of life and compare these facilities with a similar suburban City of Palo Alto. Translation: Cars are Guests. In other words, Cars must yield to bikes. As you look down the intentionally narrow street, two vehicles can hardly pass each other head on, which is important to force drivers to drive slower to pass each other. Furthermore, a more narrow street prevents cars to pass bicyclists. But they couldn't anyway because cars passing bicyclists is illegal on this street. Am I dreaming still? What's next!? 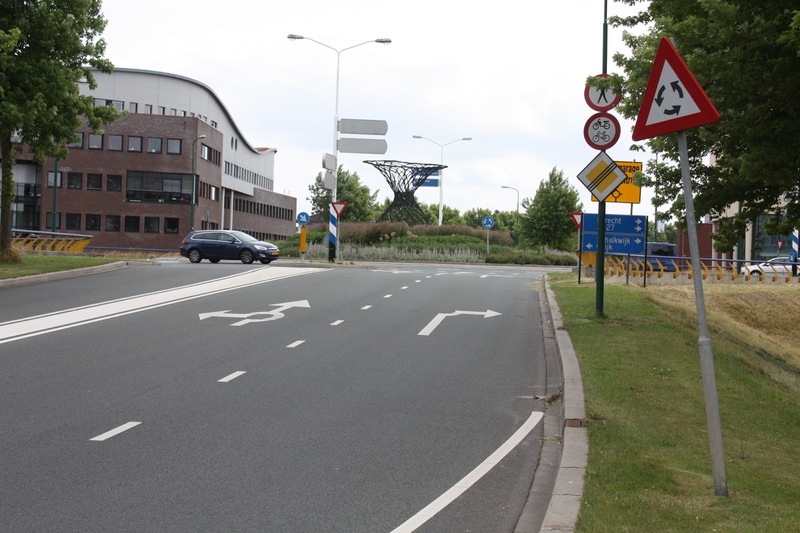 There is basically a roundabout just for bikes under the roundabout for cars. Whoa. They double stuffed this intersection like a double stuffed Oreo? Delicious. Here is also another video of my riding around the middle. Beware, the movie is silly. What's not silly is the tender loving care for cyclists by constructing a roundabout which completely separates cars and bikes. Okay, the show of Houten is almost over, only a few other showcase pictures. 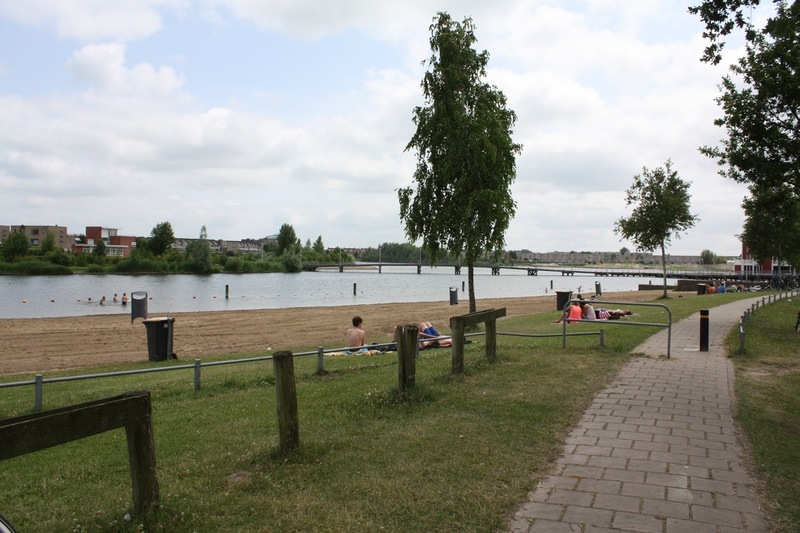 The weather was sunny and about 70 degrees, good weather for a beach trip all in the City of Houten! Here there were kids playing devoid of their parental units. Kids playing without adult supervision is an interesting concept which requires further discussion. So let's take a detour of the facility showcase and move to a discussion mode with starts with a personal story. I grew up in Palo Alto, one of the 'premiere' suburbs of the bay area so I'm told. Biking around as a kid was really easy, I thought, and seemed safe. My mom told me otherwise and said other parents were shocked when they found out I was wheeling around on my bike. 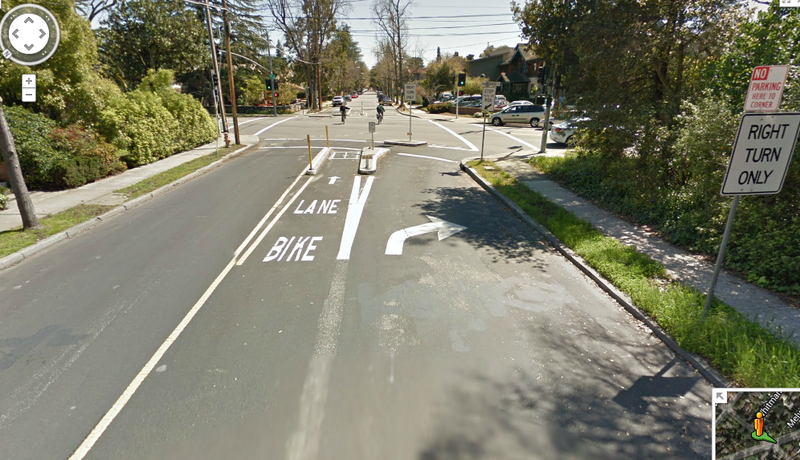 This is Bryant Street which is one of Palo Alto's 'Bicycle Boulevards'. Cars can't go through. Palo Alto was also named a bicycle friendly City in 2003 by the American League of Bicyclists. Apparently some parents thought the streets of Palo Alto were not safe and instead drove and picked up their kid every day. I won't forget the queues of cars waiting at the elementary, middle, and high schools. Anyway, remembering this story combined with Houten's facilities pops the popcorn kernals in my brain so I wonder: 1) What is the importance of independence as a kid? 2) How does infrastructure helps a kid's independence? 3) How does Houten construct facilities correctly and what should Americans know? First, let's go back to the beach of Houten. In particular, Kate Drennan (Urban Explorer from Portland) told me about a collection of thoughts she accumulated over the years about the importance of 'unstructured' play time. Kate explains. “Children learn how to make their own decisions when with other kids and without the presence of parents. They also learn about social structures and how they work, which means they may have conflicts with each other”. Does the reader remember the classes we took on conflict resolution in elementary school? These courses were needed because children are inexperienced in dealing with conflicts. However, kids need experience. If kids don't have the opportunity to make their own decisions during 'unstructured' play time they will not gain experience. Furthermore, if kids don't gain conflict resolution experience by making decisions on their own, kids do not gain independence. The more common alternative is parental supervision during play time which would intuitively prevent conflicts from becoming full blown. And how do kids have unstructured play time? I think the environment (infrastructure) is a large contributing factor to unstructured play time. Caption: The 'local' streets of Houten. The blue bicycle sign with the strikethrough simply means the dedicated bike street is over. But, the fietstraat (cars are guests) is just after the dedicated street is over, so don't worry, as a cyclist, you are still prioritized! Houten makes bicycling as safe as breathing by way of the bicycle paths leading to every destination: schools, the three downtown areas, the beach, and all housing developments. If there isn't a dedicated bicycle path characterized by not being able to see automobiles, the other option isn't bad and the cars are 'guests' and must let bicyclists do whatever they want, because in many ways, they can't even physically pass the cyclist given the roadway width is so narrow. 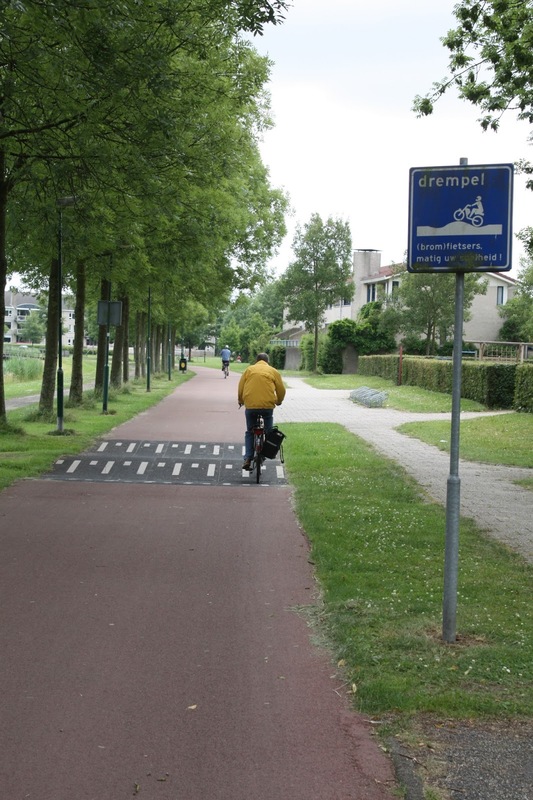 Construction of these bicycle only paths are important because not only will kids be safe riding on them, parents will know their kids will be safe on them. Said another way, the parents will know their kids will be safe in their local environment. Infrastructure is important because with roadway environment perceived to be unsafe, of course you don't want your kid out and about! 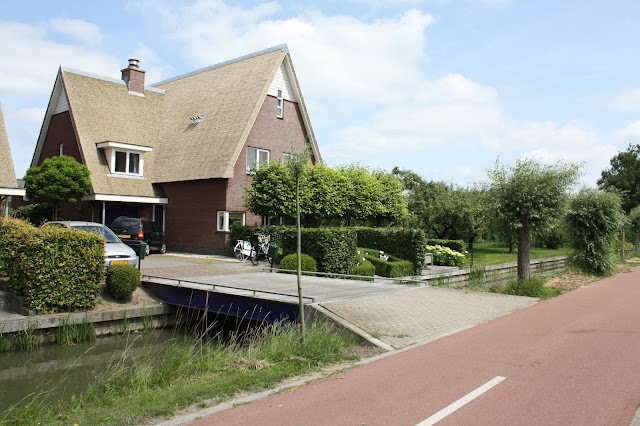 This is a single family house off of a canal and Fietstraat, which actually acts more like a dedicated bike facility. In summary, how did Houten construct a City correctly? A) Restricting automobile travel. In Houten, you can't cut through the City; no roads will get you there. But you can bike there! B) Kids are safe biking (or walking) to play with their friends. C) Parents will know their kids will be safe because the environment is safe. D) Kids can learn at an earlier age to make their own decisions and gain experience being more independent. Overall, Houten has appeared to design their City well. On the contrary, did Houten construct their City incorrectly? Well, If we compare Houten as a 'suburb' of Utrect with other suburbs of large American cities we find none of the suburbs with the exception of Davis, California even consider the bicycle as a viable means of every day transportation. Houten is also a 'planned' community, where almost the entire City was built post 1990s (Exception: old town), so there is little history or culture, or identity because of the rapid growth. Lastly, even though there is excellent rail transit access to Utrecht (the city is centered around the train station, which is 15 min away), one may feel like you are in a bubble in Houten (I'm not sure the bubble phenomena is negative or positive or just is). My general thoughts about suburbs when you compare Houten vs. a Palo Alto: Houten is leagues better from a safety and environmental (emissions and comfort) point of view. 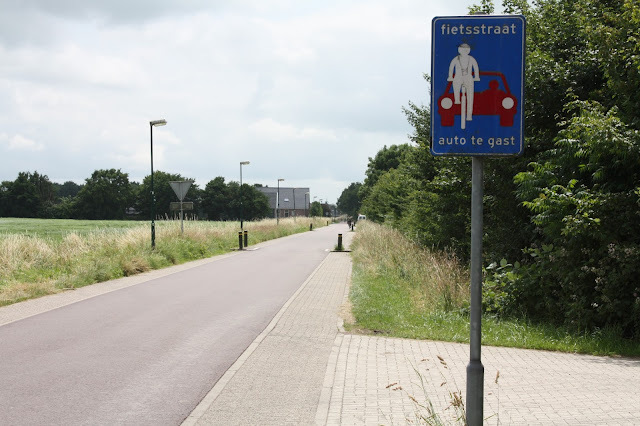 Caption: Houten and Palo Alto are about the same size and population, yet, Houten has much better bicycle facilities. As our group tour exits Houten's magical bubble and I snap back into the real world I don't wonder why we can't build more Houtens, but rather I wonder why we don't try to retrofit more cities like Houten. The Dutch appear to be very satisfied with Houten's safety performance and have copied the exceptional to other Dutch cities. Houten has been setup so kids can gain valuable social experience via unstructured play, which would have been difficult because of the lack of safe facilities to roam. Lastly, Houten gives parents assurance their kids will be safe because of the safe facilities. So instead of my mom's friends being shocked of a kid roaming on a bike, I'd like my mom to be shocked of kids who don't let their kids out to roam by bike. We can do better for our American cities and children.